The gist is this: You pick a siteswap, and run it for twenty cycles. If you drop in the middle of the run, you have to start over again. Rinse and repeat until you succeed, then move on to the next siteswap. Does that sound brutal? Yeah, it kind of is. It’s monotonous and a bit mind numbing… But it’s a good way to stay honest about your training, and helps you bulk up your juggley-muscles. But… why do you recommend this? This series of drills helps you build up endurance and precision. The tricky thing about siteswaps is that it’s all about proportions. If everything is in perfect proportion, you’ll be able to perform the base pattern (a four fountain or five cascade, for example,) enter the siteswap, and return to the base pattern without any change in the rhythm (or “metronome”) of your juggling. Human brains have their limitations, though, and can be hard to tell by executing just one cycle if the siteswap was actually proportionate or not. It’s possible that there was a slight anomaly that was too small to notice. …So how can we start to notice these issues? The 20s are a way to magnify disproportionate throw heights and iron them out. 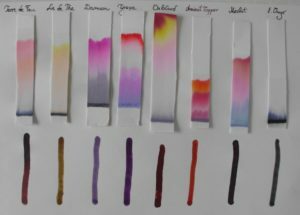 It’s almost like separation chromatography – taking a given pattern and examining where the impurities are – isolating them by allowing the errors to compound. By repeating the pattern 20 times, the errors will compound, becoming much more pronounced (likely getting to a point where you drop!) If your 744 is plagued with high 7s and low 4s, the timing will deteriorate as you run the pattern – the pattern will get syncopated. The 7s and 4s may start landing at the same time, you may have to make big changes to the timing of your throws, or it might all just collapse all together. The important thing about this drill is that you remain mindful of the rhythm of the base pattern before you enter the siteswap. After you complete the 20 cycles and return to the base pattern, is it syncopated or otherwise “off”? In a perfect world, the initial base pattern, the 20 cycles of the siteswap, and the base pattern you return to will all be on the same rhythm – all juggled to the same metronome. An important reminder: the natural height and tempo of a base pattern varies from person to person. 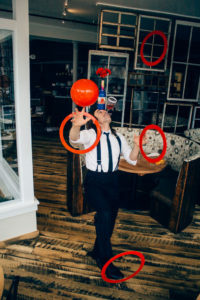 If you pick two five ball jugglers out of a crowd and get them to execute a five ball cascade side by side, their “native” height of the five ball pattern will likely be different. Siteswap is all about proportions, and these drills are about learning the relationships of differing throw heights. Here are a few patterns that I suggest training with this method. They’re listed in no particular order – try a few and see how it goes! Okay, so how is this any different than normal endurance training? The Twenties are good because they’re a simple, measurable goal. If you’re working on learning a seven ball cascade, getting long, clean runs of patterns with five and six that incorporate 7 height throws will help you in that endeavor. In your daily training, you might noodle with a few different tricks, then move on. The fact that this drill forces you to achieve a given number of cycles before moving on makes you more honest about your training. 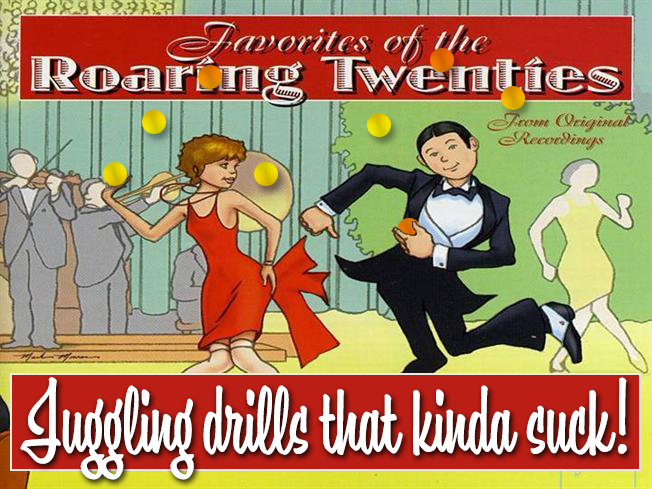 If you’re rehearsing a routine for the stage, the Twenties are a great way to make sure that your material is rock solid. Many people practice routines just by running through their act and giving the most time and attention to their finale trick. Some of these performers drop in the “easy” parts of their routine on stage and wonder why. By addressing each and every trick in a routine with this drill, you get a much more realistic view of how clean you’ll be on stage. So, yes. This is “just” an endurance technique – but it’s a framework that I’ve had a lot of success with. (It’s also pretty similar to how I learned my act for Soleil!) I hope you find it useful! I’m absolutely not saying that this is the single greatest juggling drill of all time. In fact, these days, I use this as a “filler” training method when I’m not feeling inspired or motivated. Do the drills, let the results be the results, and move on with your day. It combines siteswap training with endurance, so it’s a good way to have a varied practice without thinking too hard and ensure you won’t be slipping backwards by taking a day off.